Just like nature, marriage too goes through different seasons- spring, summer, autumn, and winter. 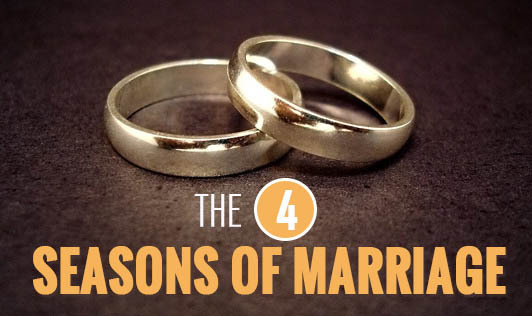 A strong and happy marriage is one that survives all of these. Every couple goes through these phases, but they need not experience it in the same order. Marriage, though usually considered as a bond between two people, can also occur as a state involving the intimate relationship we share with ourselves. This is called ‘inner marriage’ and it complements the ‘outer marriage’ we have with our partner. A strong inner marriage built on self-respect and understanding is highly important in order to experience harmony and peace in the outer marriage. Spring brings with it warmth, optimism, and excitement. Couples begin this phase with matrimony. Both individuals become invariably dependant on each other, believing that their spouse can fulfill their dreams and expectations. This is also known as the projection phase. Couples welcome the summer phase by bringing children into the world. Children help to momentarily fix the cracks that have appeared after spring, by filling them with love and fun. But summer also brings with it adult responsibility. During this period, either partner begins to notice the flaws in their better half. It can even grow serious for some couples, when they begin to doubt if they made the right choice. Also, personal communication is halted here with both individuals trying to fix their children’s lives. This mid-life crisis is a period of struggle. Once the children set up lives of their own, spouses eventually realize that all along, while they waited for their partner to change, it should have been them who should have changed. Once again, the importance of inner marriage comes to the forefront. Spouses begin to work on themselves again. They begin to understand the connection between inner and outer marriage. This season is about transition. Couples watch their children enter the summer season of their marriage by having children. At this point, the elderly couple tends to find joy and happiness through their grandchildren. They watch families grow and begin to understand life’s path. At this point, either partner can stop to consider how they want their life to proceed. Some would want to retire and enjoy life, while some would want to combine work and rest. This is the final season of marriage, usually marked by ill health and eventually the death of either partner. Some couples have to deal with the sudden twists of fate, while others have time to go back and reflect on all the important moments in their life, and realize how they helped each other transform and grow. They spend every moment by trying to enjoy the time they have left and try to make every day count. Every couple need not go through their marriage in the same orderly fashion as the seasons place themselves. Couples are constantly transitioning from one ‘season’ to another and changes may not present themselves annually. So don’t be worried is you have been stuck in extreme summer or winter for too long. What you should keep in mind is that the key to a happy marriage is to approach every season with a positive attitude.